BTjunkie, one of the largest torrent file-sharing sites, shut down voluntarily over the weekend. The service ranked among the top five torrent sites on the Internet and was never involved in legal action, but recent moves against the likes of MegaUpload and The Pirate Bay have influenced BTjunkie’s closure. 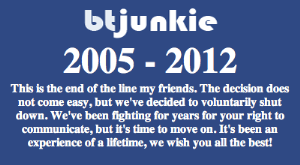 “This is the end of the line my friends,” reads a short message from BTjunkie owner, now visible on the site. “The decision does not come easy, but we’ve decided to voluntarily shut down. We’ve been fighting for years for your right to communicate, but it’s time to move on. It’s been an experience of a lifetime, we wish you all the best,” the message says. BTjunkie’s founder told TorrentFreak the recent high-profile legal action against popular sharing sites such as MegaUpload and The Pirate Bay “played an important role” in making the decision. The founders of MegaUpload were arrested in January and face up to 20 years in prison for the biggest charges of copyright infringement in U.S. history by enabling some $500 millions of illegal downloads of films, music, and other content. Founders of The Pirate Bay, probably the largest torrent file-sharing site, were ordered to serve up to one year of jail and fined around $5 million by a Swedish court in late 2010. Unlike MegaUpload, where feds seized the domain and shut down the site, The Pirate Bay is still up and running and moved from .org to .se to avoid U.S. officials seizing the domain. The site is also serving magnet links by default now, instead of torrent files, to make downloading harder to trace operations down to individuals.